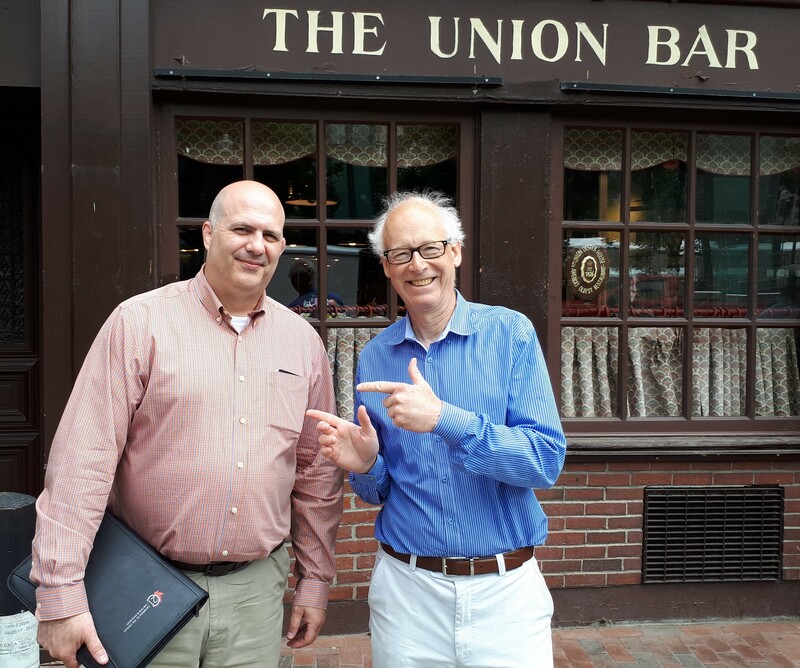 Recently, we met with Alan November at the infamous Union Oyster Bar in downtown Boston. It was a bit surreal chatting with this icon of the educational world over a 2 hour chowder in the booth next to Kennedy’s infamous booth in one of Boston’s original institutions. He was most generous to meet us in town to spend his valuable time with strangers and talk education. Thank you. Mr. November has such a large network and set of experiences to draw upon. I love that he talked about practical examples of classrooms and teachers that he knows- theory put to practical use. I found it interesting that he told a story about a physics teacher that I should absolutely meet and with whom I should spend some time as a fellow physics teacher. It turns out, that he was speaking about Robert Goodman, someone I already knew. Robert and I were both back-to-back guest presenters at the SMART Technologies Collaborative Classroom way back in ISTE San Antonio 2013 just before they released Smart AMP; even before it had a name or a platform. He presented on how he is using SMART Notebook to bring a needed level of continuity and consistency to physics teachers in New Jersey and how they were recruiting and training physics teachers with his SMART Notebook content. I presented on my design of the Collaborative Classroom, the same room in which we were presenting. The more we chatted with Alan, the more we realized that we were on the right track. We have been pushing the boundaries a little bit and were uncertain how far the pendulum should swing. He confirmed almost everything that we said. While I have been using technology and STEM and STEAM etc.. he warned me not to get attached to a particular piece of kit or acronym or program because they will not stand the test of time. However, good teaching will. That is exactly what I have been working hard to do. As I present around the world, my father , a retired master teacher, often remarks, oh, that is so 1974 or 1989 or 2003. He has seen the pendulum swing left and right and back again multiple times. Dad would say that there are lots of kinds of students who need lots of kinds of teaching strategies regardless of the program, the school improvement plan, the acronym, the buzzwords or the posters. Alan November makes me think about my classroom. On the outside, my classroom looks tech rich, but quick observers do not take the time to see that the devil is in the details. Observers are blinded by the tech and do not take the time to see the small but critical nuances in the PEDAGOGY that tech allows to happen, that is the real nugget of innovation and the real difference in making our students future ready. For example, when I say that I use SMART Boards, people only hear SMART Boards and move on because they have gone as far as they can go with that tech without listening to how much further and different we have gone. The same thing happens with Probeware, O365, SPAN Walls etc… I need to find a better way to elevator pitch the critical nuances. While we use the same terms, I am uncertain we have the same understanding. When we use STEM, STEAM, Collaboration and Critical Thinking, I worry that observers too quickly dismiss what we are doing and say, “we are doing that too” and miss the golden nuggets that make it different. It seems odd that a physics and chemistry teacher from small town Riverview New Brunswick is interacting with people like Alan November, that he is recommending we talk to people, some of whom I have already interacted, and confirmed a path that I started a number of years ago, long before STEM, STEAM, Global Competencies were in vogue. I believe our ideas will last long after these terms have been replaced with the next round of terminology to describe what good teaching in the 4th industrial revolution might be.